We offer Lawn Care & Maintenance Services. Our Lawns offer a rolling expanse of greenery soothing the eyes and the soul. Our artificial grass is so versatile that is can be installed residential or commercial in roadway medians, outdoor areas in restaurants, pool side, hotels, roof, garden, schools etc. By understanding the demands of our patrons in the best possible way, we are increasingly engrossed in offering Lawn Maintenance Service to our clients. Delivered in tune with the standards defined by the industry, these services are enormously in demand. Due to their cost effectiveness, these provided services are hugely treasured. Our provided Lawn Grower Services is highly commended in market for their on-time execution and cost-effectiveness. Our professionals use advanced technology and equipment to render this service. This service is provided to the prestigious customers at economical price. Due to years of practice in the market, we provide Lawn Maintenance Service. 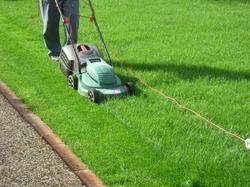 Our service is hugely utilized for lawn maintenance. We render this service within prearranged time frame. Professionals complete all work as per customer’s demand. We present this service at reasonable prices to our patrons. We are rendering Green Lawn Maintenance Service. These services are rendered by expert’s team who has rich industry experience. Due to high demand, we render this service as per patrons demand. Moreover, we render this service at low costs. Shubham Biz Facility Management Pvt. Ltd.
Garden design is the creation of plans for layout and planting of gardens and landscapes. Garden design may be done by the garden owner themselves, or by professionals. Most professional garden designers are trained in principles of design and in horticulture, and have an expert knowledge and experience of using plants.